Try setting the pool thread to 2. But again, make sure you understand my above post. There is no difference binary wise between update 7 and the patch. Gentlemen, we have real improvements. AMD Fusion motherboard, pre v7 version. @Brahim, half way already. Hope you can also improve write speed. @golduck, have you tested your hardware with ubuntu? It would be very interesting to crosscheck our results. !Sorry for the image size! 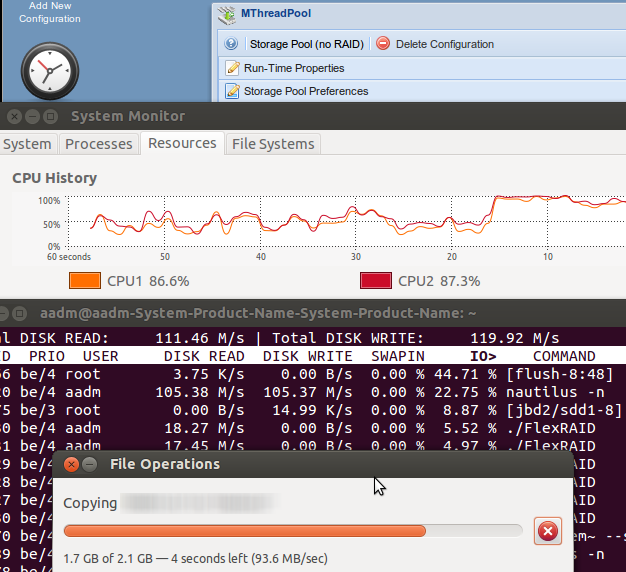 i use cruise control Raid, one of these day i make some screenshot, the next week i replace the e350 with ivy bridge, for use with ESXi 5 but before make the change i make all the test! Those results will be very interesting to analyse and compare against mine. I would postpone the hardware swap until getting results compared. tomorrow, if i find the time, make all the result and the test with E-350, i have to change the platform due to the power, e-350 is not sufficient strong for 3 virtual machines, and for vt-d instruction! i hope this is useful from someone! when i assembly the new server i post the new result! 1. Are you now saying your write speed went from 36MB/s to 6MB/s? 3. Can you attach your sys logs? 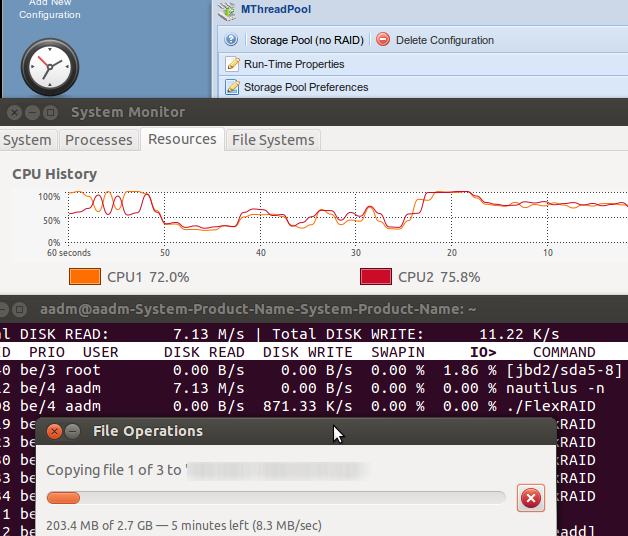 @Brahim, the 6MB/s is more or less in line with what I'm getting with a similar system. The same for FlexRAID off transfers. I don't know, but It does look like Fusion is crippled for FlexRAID purposes. I had plans to expose of the advanced settings, but I can't think of a setting that would make a real difference yet. No doubt that they have enough power to handle the task. Any difference with setting the thread count to 1 vs 2? I think I had thread count set to 2. I don't think that the speed issue related to your hardware or FlexRAID thread settings. FR uses fuse filesystem, which is slow by the nature. mhddfs /mnt/hdd1,/mnt/hdd2,/mnt/hdd3 /media/pool-o allow_other and check the r/w speed.